3. Brew the tea! I used a few too many tea bags for my desired shade (I found out by doing my test swatch)… so I had to delude it a bit with extra water. No biggy. 4. Do. A. Test. Swatch! Trust me… I’m usually one to wing it and assume nothing will go wrong… but had I done that, I would have left my fabric in far too long, and messed up everything on earth. 5. 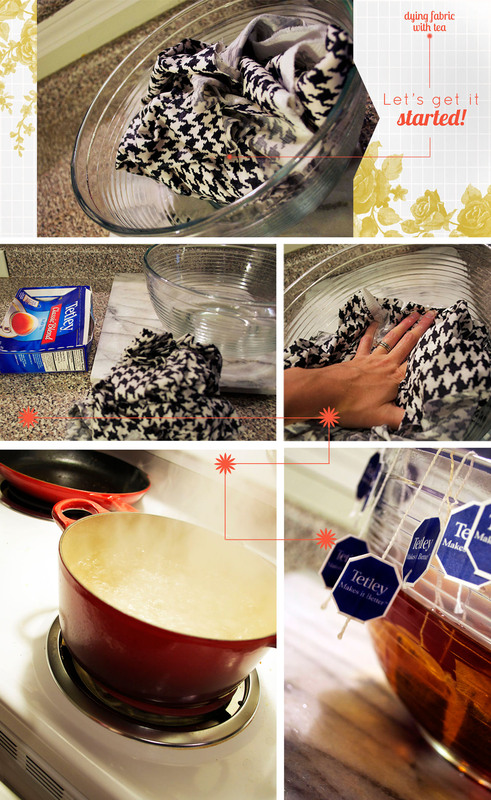 Add damp fabric, mixing and soaking to make sure every little wrinkle is in the tea. 6. Keep an eye on the time! Mix and check often. I was going for a very faint tint, so I soaked my fabric for 5-6 minutes in a fairly strong tea brew. Remember that it will look a bit darker while went then it will when it’s dry. 7. When you’re done, wring it out and admire the loviness! 8. Air dry until damp, then press with an iron to set the color. Stay tuned to see what this lovely fabric becomes! I’m pretty excited about it. Hint, it does not involve a sewing machine or thread. I hope this inspires you! You could dye your pillow cases, your towels, your hat collection, all of your significant-other’s shirts… really any cloth in your home is fair game. Just go for it! I have done this with amazing results. So excited, found so old embroidered pillow cases of my grandmothers and they are still as white as snow. Going to make them more vintage to fit with the bedding. Up date will follow, Thanks for sharing! that’s awesome! What a treasure! The tea dying worked really well for my fabric, but I haven’t washed it at all (I use the fabric in my artwork)… you might want to look into the longevity of the dye. Wow! this is a great idea..